Millennium Foundation Kosovo welcomed the new US Ambassador in Pristina, Phillip S. Kosnett in the new premises today. Ambassador Kosnett was hosted by the MFK CEO Petrit Selimi, MCC Country Director Sarah Olmstead and the entire MFK team. 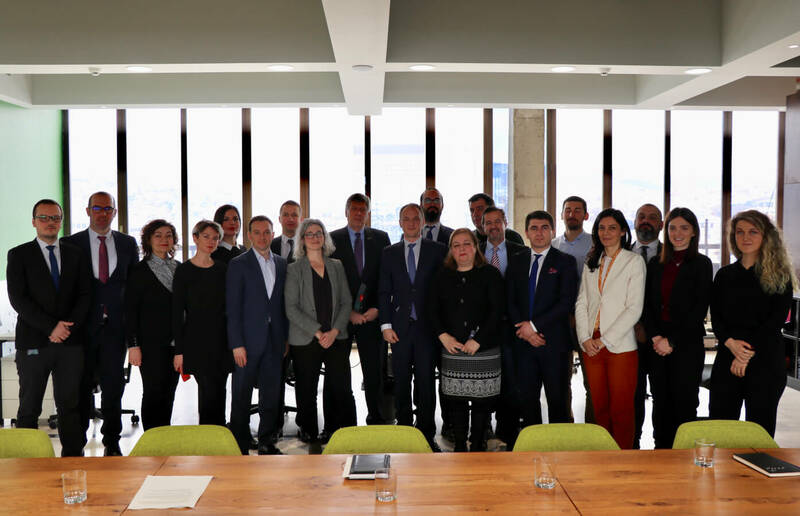 In his remarks, CEO Selimi presented the team working on implementation of the Threshold Agreement with the Millennium Challenge Corporation. MFK project leads presented various activities under energy, governance and gender inclusion projects. Threshold Program for Kosovo is the second biggest program in the world for MCC. Kosovo government has established MFK as an implementing entity for the program and the staff numbers 23 experts from diverse fields. Ambassador Kosnett confirmed strong US support for Kosovo, which includes the ongoing Threshold Program worth 49million USD, reiterating that US support is based on helping Kosovo achieve prosperity, improve rule of law and increase regional stability. He also emphasized that potential Compact investments by MCC are conditioned with continuous work by the Government of Kosovo on improving and reporting the progress on the rule of law in Kosovo.